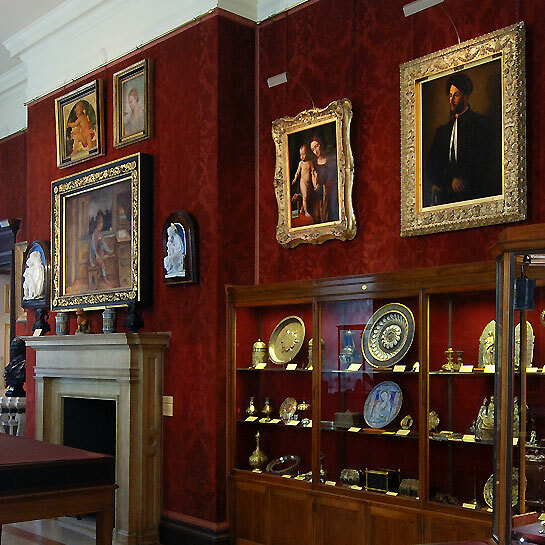 The Wallace Collection is a national museum consisting of 25 galleries in a historic London town house, displaying wonderful works of art collected by the Marquesses of Hertford in the 18th and 19th centuries. The Sixteenth-Century Gallery with its amazing exhibits had never been properly lit. The challenge was to achieve a significant improvement in lighting within a sensitive historic interior which was not being refurbished, without going to the expense of a full-scale building operation. The outcome should be a fully powered lighting system, enabling flexibility for future changes in picture hanging at the gallery. Charles Marsden-Smedley, an international museums specialist, was appointed to design a flexible lighting scheme which would impact least on the historic setting, while ensuring all wiring would be hidden. He specified a low-voltage system with frame-mounted picture lights. Multiload’s VoltMaster Intelligent Transformer provided the solution for distributing power to the lamps as there was nowhere to locate transformers. Having previously used it at the National Maritime Museum, Greenwich Charles knew VoltMaster would be future-proof. Its flexible positioning meant it could be placed at considerable distance from the lamps while giving stabilised lighting - essential for works of art. David Fitter of Multiload was commissioned to install the system. He also recommended using Powerail, a picture-hanging rail system distributing low-voltage power to picture lights. Power-feed connectors plug into contact points along the rail, allowing feed wire to be positioned at the suspension chain and run down into lights above the frames. Produced in natural brass with finials, Powerail was in keeping with existing picture rails, giving many wiring design options and causing minimal disruption when cabling or re-positioning paintings. As the wiring had to be virtually invisible, long cable runs in mini PVC trunking were run around the room along existing plaster mouldings. These were painted to match pillars and mouldings, so that no changes were necessary to the wall fabric. There were only two suitable hiding places for positioning the remote VoltMaster transformers - these were in the bases of two central display cases on either side of the room. Between these cases two columns were used to run cabling up to the ceiling and feed the Powerail. The installation was completed in two stages: first, the cable and trunking, followed by the assembly and connection of the VoltMasters and Powerail. The logistics were carefully planned by Helen Jacobs, which meant the gallery only needed to be closed for a few weeks. Charles Marsden-Smedley completed the installation, fixing the light fittings to the picture frames and focussing and adjusting the light output. The result was that the paintings could be seen for the first time in many years in their full colour and glory. The new lighting scheme in the Sixteenth-Century Gallery has received extremely positive feedback from our visitors and the curatorial team. We were delighted that the solution enabled us to successfully light the paintings without disruption and delay which building work would have involved. The Powerail sits comfortably within the elegant surroundings at The Wallace Collection. Multiload were a pleasure to work with, and David Fitter was fantastic in helping us resolve problems, working flexibly at short notice to fit into a tight programme, and operating happily within the sensitive environment of a museum.